The late great Stephen Hawking knew about the power of books, the power of reading, the power of being read to. And nothing is more empowering to your little ones than reading with them. 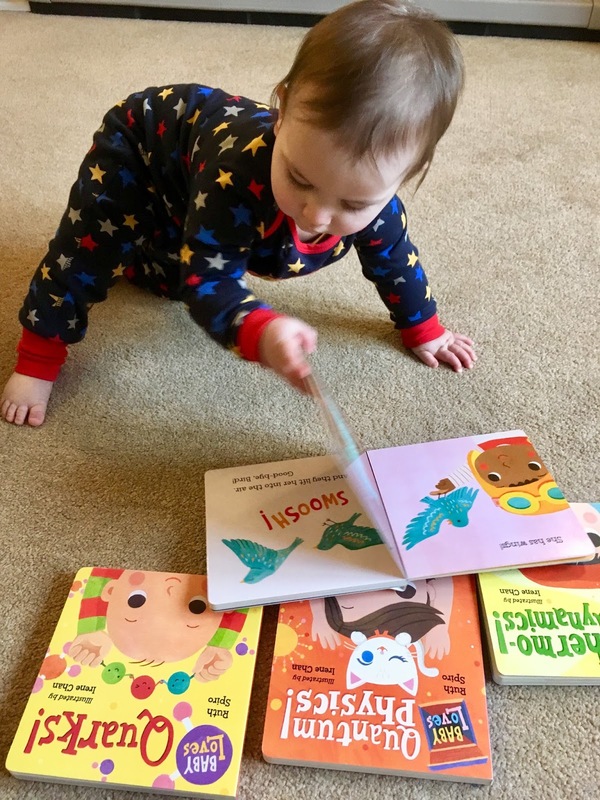 If you want to raise baby geniuses, reading is the key. Einstein said "if you want your children to be intelligent, read them fairy tales. If you want them to be more intelligent, read them more fairy tales." And he's right. But in Einstein's day they didn't have access to as many awesome books as we do today. And I reckon he'd be an advocate of this 'Baby Loves..." series by Ruth Spiro and Irene Chan. We are super keen scientists in this house: Papa BookBairn has been trying to teach Mummy phsyics concepts since she was tiny (with very little success - though I do have a Standard Grade in Physics from school so he can't have failed to miserably) and he know introduces science concepts into play with his grandchildren. 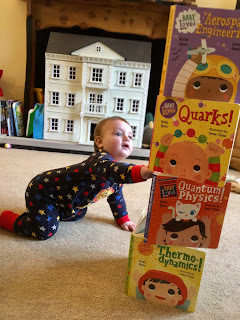 The Wee Page Turner is definitely a fan of knocking down towers to learn about gravity and I overheard some play with BookBairn's slinky being a discussion of waves. So these board books fit perfectly into our life! 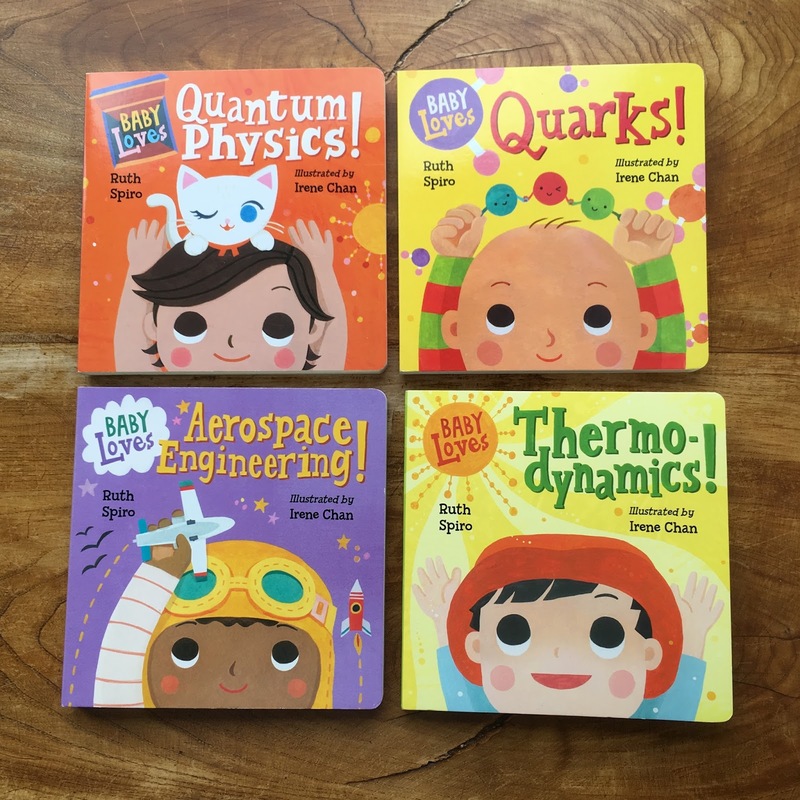 Each book takes a (sometimes rather complicated) science concept and simplifies it into a simple story for the tiniest readers. "Quarks" is about protons, neutrons, electrons, atoms, molecules and all the teeny tiny elements that make up everything on our planet. Introducing vocabulary like this to babies may seem strange, as to us these are quite scientific words that we don't use in every day life. But to babies and toddlers these are just new words. No more tricky than dog or cat. So what a great way to give them tools for understanding at such an early age. "Quantum Physics" is my favourite in the series. It's a simple retelling of the theory of Schrodinger's cat. (For fans of the Big Bang Theory you will no doubt be familiar with this theory.) In basic terms (as this story puts it) if you put a cat in a box and close it, you don't know what the cat is doing: it could be awake, it could be asleep. (Schrodinger's original theory is more blunt with life and death and radioactive material involved.) Whilst baby doesn't know if cat is awake or asleep, the cat can be thought of as both awake and asleep simultaneously. (No dead cats in this baby friendly version thank goodness.) 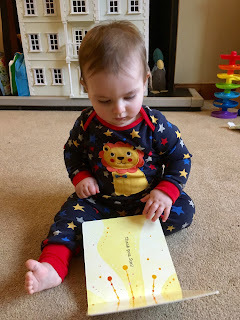 This has turned a complicated concept into a lovely story for babies. And The Wee Page Turner loves it - perhaps it's the cat snoring sounds that he find hilarious? "Aerospace Engineering" explores how birds fly. Now I know babies don't ask these questions (or maybe baby geniuses do?) 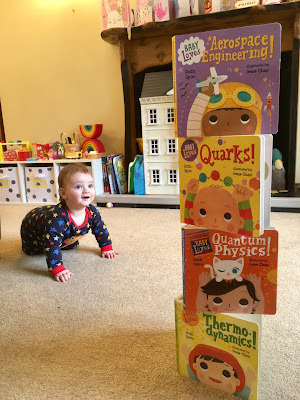 but BookBairn is beginning to ask questions like this and we now have this book as a tool to explain the simple science behind the physics of flight for birds, planes and rockets. If that's not a perfect parenting tool for inquisitive toddlers I don't know what is. I need books like this for all her how and why questions! With illustrations that help me understand and explain. "Thermodynamics" is about being full of energy! About how energy is transferred. Starting with sun, air and water, the tree can grow. It can grow apples. Apples which feed the baby. And the baby can turn into energy to play. And read stories!! The illustrations in these books are a great support to the text, which is, appropriately, very simple. Like diagrams that unlock the formula, the illustrations in these books are central to unlocking the text and the science. The babies are adorable. (As babies should be.) And the pictures are well thought out - really bring the science to life. I love the soft colour palette in the majority of the pictures and I love that the backgrounds are very simple and plain allowing little readers to really see the science without any distraction. In short, these books are perfect for baby geniuses. And would make wonderful new baby gifts for science nerds and science dunces alike. Maybe parents will learn a thing or two as they read with their babies! I can't wait to add the new release "Gravity" to our collection. Though from the photos you will see that The Wee Page Turner is already quite familiar with the concept as he knocks down towers, giggling with delight as everything tumbles to the ground! 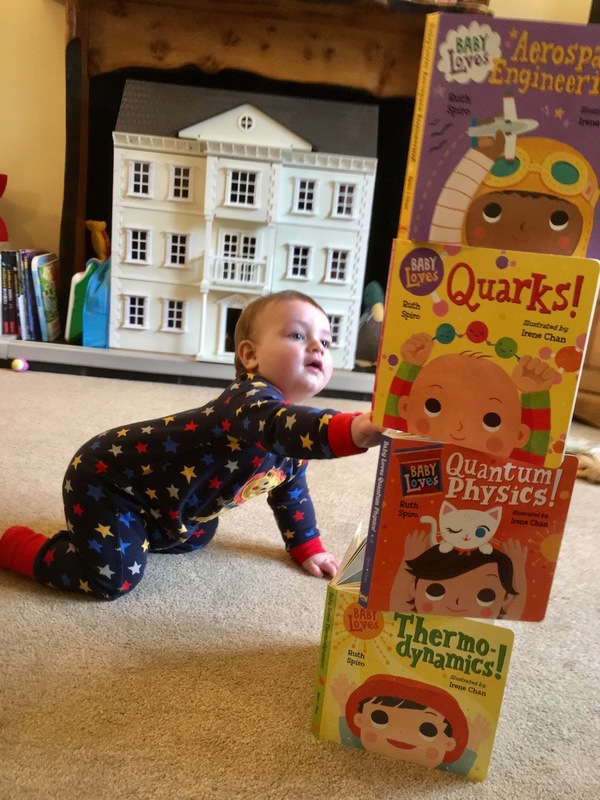 Baby loves Science! 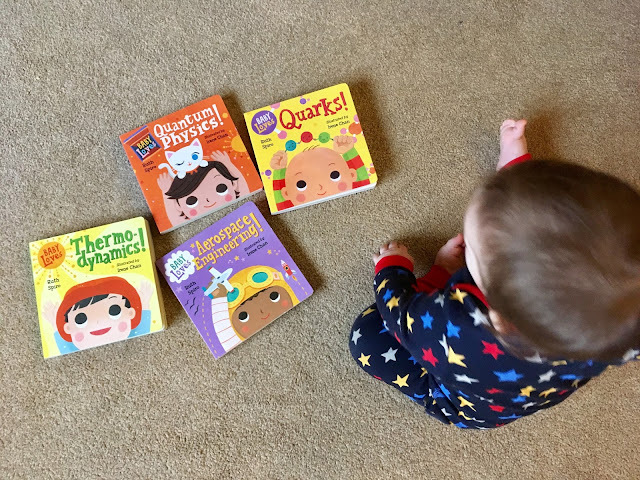 Baby loves reading about Science too! P.S. Papa BookBairn we love your science lessons!! *DISCLAIMER: we were kindly sent these books from the publisher after I requested them. Our words and opinions are, as always, our own. I love these books and I can’t wait to get into Enthalpy and Entropy with BookBairn and the Wee Page Turner. Flight is all about the Bernoulli Effect and maybe we will solve Schrodinger’s Equation using partial differentials. What do you think? Yesterday, while out for a walk, we passed the clock tower near BookBairn’s home (the one she says is like Big Ben) and we had a chat about time. Prof Hawking would’ve been proud of us.